Welcome to Lame Duck Rescue! Our rescue suffered almost total destruction from Hurricane Katrina and we are no longer physically able to do the work needed to keep the rescue operational. Thus, we are no longer taking in rescues. 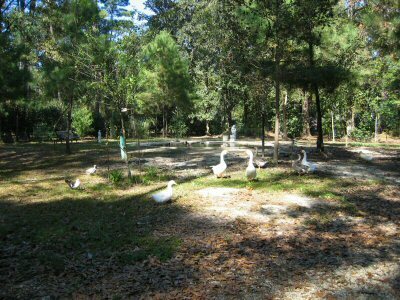 This site is dedicated to the rescue of Domestic Waterfowl. This site will be an ongoing project dedicated to educating the public against buying chicks, ducks and geese as Easter pets. Chicks, ducks and geese are not toys; however, they are living, breathing animals. They deserve to be cared for with love and respect. Many individuals purchase ducklings, chicks and goslings as gifts for children at Easter. When purchased they are cute, fuzzy, peeping babies; however, within a very short period of time, they grow to be large, quacking, honking , yes, pooping adults. To eliminate this nuisance, their owners bring them to local parks and turn them loose to fend for themselves. This is a VERY, VERY bad practice (not to mention it's illegal), as they have become dependent upon the owner for food and protection. They have not developed a fear of man or other animals such as dogs thus making their survival questionable. Any wild ducks found without it's mother should be turned over to a licensed rehabber, wild ducks are federally protected wildlife. A few individuals realize their mistake and seek humane disposal options. That’s where we and others like us, come in. Our local feed stores who originally sold the babies provide my contact information to those seeking a home for their ducks or geese. Some of the breeds of ducks we have rescued (Indian Runners for example) could not possibly survive in a public park atmosphere. Other breeds, like the Muscovy's, have become a public nuisance. They have wandered from the parks where they have been abandoned and into residential areas. They set up residence on fences, roofs, driveways and at front doors. Angry residents want them disposed of and/or killed. We also don’t condone feed stores selling these babies without a hint to the purchaser of what to expect or how to care for them. Many of these “pets” don’t make it to adulthood in the hands of children. Also, each year many elementary school classrooms hatch eggs to teach children about life. But once grown there is no place for the ducks to go. What mixed messages kids get about the value of life with such experiences. Dedicated to Cassini, Ayla and Phoenix.